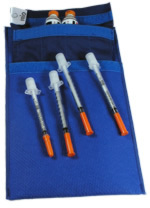 The FRIO cool insulin case keeps insulin safe for 45 hours each immersion period. Simply soak in cold water for 5-15 minutes to activate. This lightweight diabetes case never needs refrigeration and is designed to hold one Insulin Pen. Compact and reusable, this diabetic carrying case measures 7 in x 2 1/2 in. Available in black, blue and burgundy.